Yes, Christmas in our house is full of Peppermint Cookie recipes Christmas baking fun. We love baking recipes we’ve found over the last several years, recipes we’ve created, and recipes that have been handed down from Grandma. And while we’ve drastically cut back on the number of Christmas cookie recipes that we bake each year–because we are so busy–there are some that the holidays just wouldn’t be the same without. The best Christmas cookie recipes have a history. They have a story behind them that makes them special to those who enjoy creating or devouring them. They have memories associated with them that are the basis for holding those Christmas cookie recipes close, cherishing them, and passing them down to the next generation. Last year, I put a little twist to an old recipe and made the best Snowball Cookie recipe I have ever had. This year, we’ve adapted the recipe just a tad again, and we added some NESTLÉ® TOLL HOUSE® chocolate and sprinkles to our snowball cookies, adding an extra layer of delicious flavor. Our NESTLÉ® TOLL HOUSE® snowball cookie recipe is one of our favorites, and adding that chocolate to the top is both fun and tasty. With easy cookie recipes Christmas baking can be fun and and relaxing. There is no need to get stressed out during the season of giving when the whole point behind baking Christmas cookies is to bring joy to those around you. These Snowball Cookies are the best, and super easy to make. With ingredients you likely already have on hand (except for maybe peppermint extract), you can throw these cookies together in a hurry. All you needs is butter, sugar, flour, vanilla, peppermint, pecans, a couple candy canes and powdered sugar. With our new twist, we are adding in some melted NESTLÉ® TOLL HOUSE® Milk Chocolate Morsels–because we almost never say no to chocolate. You could also use our favorite NESTLÉ® TOLL HOUSE® Semi-Sweet Chocolate Morsels– famous Semi-Sweet Morsels have been helping to bake up the best for generations. Delicious in desserts or right out of the bag, these morsels bring versatility and convenience to any baker’s kitchen. We can’t keep them around long enough for all our holiday recipes. We also added just a tad of Christmas red and green sprinkles to make the cookies even more festive. Cream butter and sugar. Incorporate flour and then add next four ingredients. Form one-inch balls and then bake for 25-30 minutes. Remove from oven and coat in powdered sugar while still warm. Let cookies cool, and then coat them in powdered sugar a second time. Melt chocolate chips in microwave safe glass bowl by microwaving for one minute, stirring and then microwaving in 30 second increments while stirring between each additional 30 seconds. 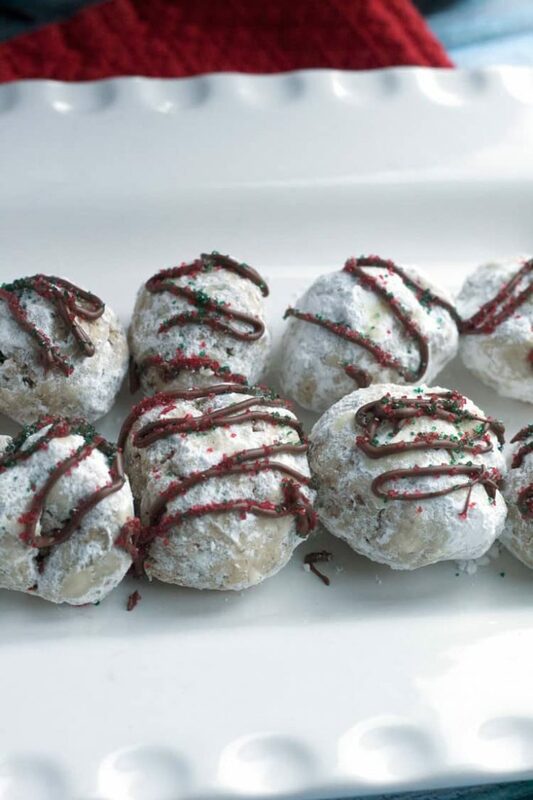 Drizzle chocolate over Snow Ball Cookies and immediately sprinkle with decorating sprinkles. Place in refrigerator for 10 minutes to harden chocolate.